Although it is not a tool, per se, the Android documentation is a key resource for Android developers. An HTML version of the Android documentation is provided in the /docs sub-folder of the Android SDK documentation, and this should always be your first stop when you encounter a problem. 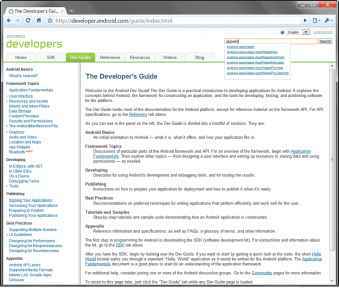 You can also access the latest help documentation online at the Android Developer website, http://developer.android.com. Android developer documentation (online version).